The collection has been arranged alphabetically by subject. Historically, before the final establishment of the institution of the Office of the University President in 1930, the Provost used to be the head of the University of Pennsylvania responsible for both academic and administrative activities of the School. Quick growth of the University and great expansion of the scope of its multifarious activities gave rise to the need for some fundamental changes in the mechanism of the school leadership. In the decade from early 1920s to early 1930s, the University went through a zigzag course in exploring for an appropriate way to reorganize its leadership system. The twists and turns in the course underlined a struggle between the forces in favor of the changes and the resilience of the existing order. The movement began in December 1922 when the University Trustees, “in recognition of the great growth and development of the University and its activities,” decided to create the office of the University President as the “Executive and Administrative Head of the University”while re-defining the office of Provost “as the Educational or Academic head of the University.” This incipient proposal conceived the idea of creating two separate and parallel institutions, for the Provost was to have “all of the powers, duties and functions heretofore vested in and devolved upon the Provost, which shall not be vested in the President of the University.” A Special Committee of Five Trustees was formed for further discussion of the duties of the two Executive Officers, the changes in the existing Statutes necessitated by the creation of the new Office of President and the selection of a suitable person to fill the office. A twist came in the middle of the year, however. For reasons unknown, the Trustees, instead of finding a new and suitable person to fill the office of President, selected in July Penniman President of the University of Pennsylvania. The Board of Trustees requested in the meantime Penniman to “act as Provost until a new Provost shall have been chosen.” As Penniman was now President and Provost concurrently, the Trustees raised his annual salary from $15,000 to $25,000 in November 1923. The movement of relapse finished a full cycle by late 1926. On November 15, the Trustees approved “in principle” the consolidation of the offices of the President and Provost under the title of Provost. In December, the Trustees formally abrogated the title of University President and restored the Provost as head of the University. To assist the Provost, the Trustees decided to create the positions of three or more Vice Provosts to share the responsibilities in such fields of activities as faculty matters, student matters and the relations with the public. The momentum for change surged again five years later. In January 1931, the Trustees approved the revised Statutes of the University. The new Statutes stipulated that the collective of University Officers consisted of “a President, a Provost, four or more Vice-Presidents, a Treasurer, a Secretary, a Comptroller, a General Counsel, a Librarian and such a number of Deans and Directors as the Trustees may from time to time approve.” The Trustees, again, made the President of the University “head of the University” to whom “all officers of the University shall be responsible.” The role of the Provost was re-defined as “the senior educational officer of the University” who “shall be a member of every Faculty of the University” and “shall advise the President upon the educational policies and development of the University.” [The Agency History of the Guide to the Martin Meyerson papers (a draft that has incorporated Mark’s revision) includes a paragraph with a quote that is supposedly from the University statutes revised (???) in January 1932 (???). The paragraph runs like this: the University President was defined as “the educational and administrative head of the University with all powers comparable to those of a corporation,” to whom all officers, instructors, and employees of the University were responsible. The President, in turn, was responsible to and reported to the Trustees, and served simultaneously as the presiding officer of the Board of Trustees.] The first person elected to the newly-defined head position was Thomas S. Gates while Josiah H. Penniman retained the position of Provost. The new executive and administrative system of the University, which took a whole decade to shape and emerge out of drastic twists and turns, has been in existence since then. It has functioned without much change in the past half century and more. Beginning in the late 1920s, positions of Vice Provosts were gradually created as various needs arose. 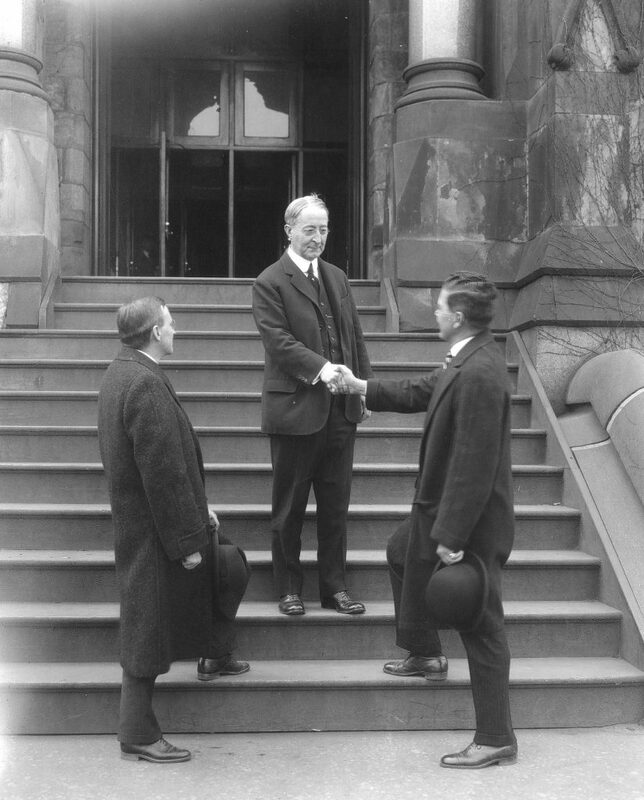 In 1928, the Trustees established three Vice Provost positions. One was to supervise the Undergraduate Schools and the Graduate School of Arts and Sciences; the second to be in charge of the Medical Schools, Institutes and Departments; the third to exercise supervision over the administrative business of the University as well as over departments not attached to any one school or group of schools. All three Vice Provosts were responsible to the Provost and to the Trustees. One of them (in the order designated by the Trustees) would act as Provost during the absence or inability of the Provost or during a vacancy in the Office of Provost. The Vice Provost in charge of the Undergraduate Schools would also serve as Chairman of a Committee on Student Welfare. In January 1954, at the recommendation of President Gaylord P. Harnwell, the Trustees appointed two more Vice Provosts to strengthen the Office of the Provost. One was to be responsible for research funds and awards, research publicity and relationships with learned societies; the other for budget matters, teachings loads and records, Summer School, Undergraduate calendar, etc. In 1973, a new position of Vice Provost for Graduate Studies and Research was created. A committee was formed to search for the position. In the same year, another committee was constituted to search for a Vice Provost for University Life. The two latter offices were alternatively named in later years as Vice Provost for Research and Vice Provost for Undergraduate Studies and University Life respectively. The Office of the Provost was most recently reorganized in the summer of 1999 by Provost Robert L. Barchi. Under his direction the principal functions of the Office are managed by an Associate Provost, a Deputy Provost, and four Vice Provosts. The Vice Provosts include one for the University Libraries, one for Information Systems and Computing, one for Research, and one for University Life. The Associate Provost manages the academic personnel process including recruitment, appointments, promotions, tenure cases, grievances, oversight of faculty policy changes, and administrative review of faculty policies. In addition, the Office of Student Conduct reports to the Associate Provost. The Associate Provost therefore also reports to the Provost on matters related to the student judicial process in cases of academic integrity and student conduct violations. The Center for Greater Philadelphia also reports to the Associate Provost. The Deputy Provost is the Provost’s chief advisor. He works closely with the Provost and is responsible for both undergraduate and graduate education. He chairs the Council of Undergraduate Deans, the Council of Graduate Deans, and the Graduate Faculties. In addition, a number of academic and cultural units on campus report to him. They include the Annenberg Center for Performing Arts, the Institute for Contemporary Art (ICA), the Arthur Ross Gallery, the University Museum, the University Press, and the Office of International Programs. The Vice Provost and Director of Libraries. He is responsible, under the Provost’s direction, for planning, acquiring, managing and preserving the knowledge and informational resources that support Penn’s instructional and research programs. The Vice Provost and Director of Libraries has responsibility for fourteen centrally administered libraries on campus (excluding Law), the Center for Judaic Studies Library in center-city Philadelphia, and the rapidly growing “sixteenth” library — Penn’s digital Library on the World Wide Web. The Vice Provost also represents Penn’s interest in national and regional library consortia, such as the Research Libraries Group, the Coalition for Networked Information and the Association of Research Libraries, that enhance scholarly access to information, and advocate libraries in public and government arenas. The Vice Provost advises the Provost on all matters pertaining to academic information resources. The Vice Provost for Information Systems and Computing is responsible for providing core administrative information systems and the campus data network, as well as advising the Provost and President on issues involving information technology. His office serves as facilitator for addressing information technology service issues shared among service providers in the schools as well as central administrative units. It also seeks to be an innovator in the use of information technologies for teaching. The Vice Provost for Research is the spokesman for the University on research related matters. The Vice Provost for Research also has responsibility for the development and implementation of policies and procedures which promote excellence in research across the University. In this capacity the Vice Provost advises the Provost on all research programs and planning initiatives related to research. The Vice Provost is responsible for administering and coordinating a wide variety of activities at Penn, including the Provost’s Council on Research, the Research Foundation, and the Research Facilities Development Fund. The Vice Provost for Research has ongoing, direct supervisory responsibility for the Office of Research Administration (ORA) (joint with the Vice President for Finance), the Center for Technology Transfer (CTT), University Laboratory Animal Resources (ULAR), the Office of Environmental Health and Radiation Safety (EHRS), the Laboratory for Research on the Structure of Matter (LRSM), and other interdisciplinary institutes. The Vice Provost for University Life (VPUL) has administrative responsibility for offices and programs which support Penn’s 22,000 undergraduate, graduate, and professional students and the faculty and staff who nurture their interests and aspirations. The following are areas for which the Vice Provost for University Life has oversight in partnership with students, faculty, and the twelve schools of the University: co-curricular academic programs; student affairs, organizations, and student union facilities; campus resource, student health, and student support services; and University Life Information and Technology Services. The Office of the Provost is also managed by eight senior administrators: the Director of College Houses and Academic Services; the Dean of Undergraduate Admissions; the Director of Athletics; the Director of Institutional Research; the Executive Director of Administrative Services; the Executive Assistant to the Provost; the Executive Director of External Affairs; and the Assistant Vice Provost for Graduate Education. The Director of College Houses and Academic Services (CHAS) is responsible for supporting the staff, programming, and academic mission of Penn’s twelve College Houses. The Director is the chair of the Residential Faculty Council (RFC), comprising the Faculty Masters of the twelve houses. The Penn Video Network is also part of CHAS. The Dean of Undergraduate Admissions oversees the recruitment, selection, and enrollment of students for the four undergraduate schools at Penn. He sits on university wide committees and serves as a Trustee member of The College Board. The Director of the Division of Recreation and Intercollegiate Athletics also serves as Assistant to the Provost. Penn Athletics supports 32 intercollegiate athletic programs with more than 1,100 student-athlete participants. The Athletic Director also oversees Penn’s numerous recreational, intramural and community programs. This is an important service to the University community and a significant priority for Penn athletics and the recreation department. The Director of Institutional Research and Analysis directs the office which provides institutional research supporting the policy and planning goals of the University. The Office of Institutional Research and Analysis also prepares the numerous reports and analysis required by external agencies. It also plays a significant supporting role with the external school reviews, which are coordinated by the Associate Provost. The Executive Director of Administrative Affairs for the Office of the Provost is responsible for the administration of the Provost’s budget centers, and takes an active role in the financial administration for the administrative and resource centers reporting to the Provost. In addition, the Executive Director works with the Provost on university budget issues. The Executive Director represents the Provost on a number of University committees including the Network Policy Task Force and Capital Advisory Group. The Executive Assistant to the Provost provides extensive administrative assistance to the Provost, ensuring the implementation of his academic priorities. The Executive Assistant coordinates the activities of the Provost and his associates both within the Office as well as with other administrative offices in the University. She also prepares or manages the preparation of the Provost’s correspondence, position papers, agendas and reports; performs research activities including data-gathering, analysis and interpretation; and staffs various committees. In recent years, the Executive Assistant has also assisted the Provost on office and classroom space issues. The Executive Director of External Affairs assists the Provost with his communications to external constituencies including alumni, trustees, donors, public officials, community leaders and the media. She also takes an active role in the development of communications strategies for other administrative and resource centers reporting to the Provost. In addition, the Executive Director of External Affairs supports the Provost in his numerous interactions with student groups and student leaders. She has led several major communications efforts while at Penn, including a comprehensive assessment of undergraduate communications and the initial marketing efforts for Penn’s College House system. The Assistant Vice Provost for Graduate Education in the Office of the Deputy Provost assists the Deputy Provost and works on student outreach and fellowships, coordinates the Exchange Scholars program, and advises students, faculty and staff with questions about University policy. Series: Records 1929-1994 This collection documents the operation of the Provost and his staff functioning, basically, in the capacity of “the senior educational officer of the University” who advises the President upon the educational policies and development of the University as the Office was defined in the revised University statutes of 1931. It reflects all major activities of the University for a period of nearly seventy years from mid 1920s to early 1990s, focusing in particular on University academic and educational activities involving both faculty and students. There are records of administration, planning and policy-making processes on matters that concern the entire university and have hence been put in the direct charge of the Provost Office. Records of this category include files of dozens of committees, among them the Academic Planning and Budget Committee, the Educational Policy Committee, and the Committee on Academic Appointments and Promotions, as well as files on such campus-wide matters as educational survey (1954-1970), Administrative Reorganization, and FiveYear Plans. For an over-all view of the Provost Office’s work, the researcher may also look into files of the General Correspondence and a file of pink copies of outgoing correspondence from 1978 to 1984. A major sector of the collection concerns the Provost Office’s routine leadership and supervision of all individual schools, departments, centers, institutes, and programs engaged in academic and educational activities on campus. Included in this category are annual reports from and correspondence with each of the existing twelve schools, files of the two schools that are no longer in existence–the School of Allied Medical Professions (SAMP) and the School of Public and Urban Policy, and the files of such administrative and academic departments and centers as the Admissions Office, Penn Library, Museum, Morris Arboretum, University Press, etc. Also included in this group are budget files and financial files concerning all schools and departments reporting to the Provost Office and a sizable subject file named “Binders,” which keeps information collected by the Office staff of each individual school and department. Records concerning personnel changes make another important group of the collection. This group includes files of faculty appointment and files of personnel search for various administrative vacancies. Related to this category are files of many professorships, fellowships and scholarships sponsored by the University as well as records of the Biomedical Research Support Grant Committee. Also included in this group are files of Grievance cases of individual faculty or staff members involved. Material documenting relations between the Provost Office and other major decision-making institutions of the University can be found in files of Council of Deans, University Senate, and University Council while the external relations of the University have been documented in files of relevant departments and commissions of the Commonwealth of Pennsylvania and specific national academic associations and foundations. Researchers interested in student affairs at Penn may refer to files of various student activities such as student protests, sit-ins, ROTC, files of student financial aid, and statistics of student evaluation of individual courses given at each school or academic department. Related to this category is a file of the General Alumni Society recording the activities and interest of the University alumni. This collection has a substantial documentation of the representation of minorities, an issue that has become increasingly a concern in American society since the 1960s. Files of this category can be found under such titles as Affirmative Action Study, Back Presence, Black Studies, and Minority Affairs. Series: Records: 1982-2004 The records in this series document the administration of the Provost Office from the late 1980s to the beginning of the 21st century when the Office operated under Michael Thomas Aiken (September 1987 – June 1993), Marvin S. Lazerson (July 1993 – June 1994, Interim Provost), Stanley A. Chodorow (July 1994 – December 1997), Michael L. Wachter (January 1998 – January 1999, Interim Provost), and Robert L. Barchi (February 1999 – July 2004). Also included is a sub-group of earlier records of the Provost Office under Curtis R. Reitz (January 1971 – December 1972). I. Administration focusing on policies and issues of broad and general significance to the entire University. Included in this category are records of the Council of Deans, Council of Undergraduate Deans, Council on Undergraduate Education, Committee on Academic Freedom and Responsibility, research administration, institutional research and analysis, institutional intellectual property policies, a file of the 21st Century Project, as well as the general and correspondence files of the Office of the Provost. II. Administration related to academic activities concerning the faculty and the students. Included in this category are records of various professorships, scholarships and fellowships, faculty appointments and promotions, personnel files, tenure policy and system, faculty extramural activity and retirement, undergraduate grading pattern, Latin degree honors, and General Honors and University Scholars program. III. Administration related to planning, budget and funding to support academic needs and facilities. This category includes records of the Academic Planning and Budget Committee, building space issues, capital needs planning, and a file of the Diversity Fund. IV. Records concerning the executive compliance with the government policy on affirmative action. Included in this category are records of the Affirmative Action program and records of the Minority Permanence Document Review Subcommittee. V. Administration of all individual schools, and academic and research centers and programs of the University and the University health system. VI. Records that concern legal issues and cases of complaints involving the University faculty and students. This category includes several major cases, among them a Just Cause Appeal of a bio-medical faculty charged with misconduct in scientific research, which continued from 1995 to 1998; a case against the University in relation to the use of human subject in the human gene therapy research in 2000; a case against the School of Veterinary Medicine over misconduct of a faculty in experimenting a certain virus without proper measure to safeguard human beings from the risk of contamination; and a case brought about by the National Science Foundation over faculty misconduct in research and publication. Also included in this category is a file of the General Counsel of the University and several individual cases of faculty grievance over tenure, promotion and salary. VII. Records related to University life on campus. Within this category are files of fraternities, residential living, student complaints and student conduct cases, University Judicial System and student disputes, and activities related to the National Collegiate Athletic Association. This category also includes a file of Curtis Organ, and a file of the University Chaplain. VIII. Records that concern the relationships of the University with its neighboring community under the entry of Community relations. Meeting material, 1986 Jan. – Feb.
1959 Aug. – 1965 Nov. Adult Education, Committee on, Report regarding general policy, n.d. Accreditation by American Medical Association, 1970 Dec.
Review, 1976 Jan. – Oct.
part III, faculty research interests, etc. 1975 July – 1975 Sept.
1975 Oct. – 1975 Dec.
1976 Jan. – 1976 Feb.
1976 July – 1976 Oct.
1976 Nov. – 1976 Dec.
1977 July – 1977 Sept.
1977 Oct. – 1977 Dec.
1965 Aug. – 1965 Dec.
1965 Nov. – 1965 Dec. Meetings, 1990 Oct. – Nov.
Evelyn Wood Reading Dynamics Course, 1969 Oct.-1972 Sept.
Minutes and agenda, 1974 Aug. – Dec.
2-11013, 1988 July – 1989 Sept.
2-11161, 1988 July – 1989 Sept.
2-11407, 1988 July – 1989 Sept.
2-14006, 1988 July – 1989 Sept.
2-14006, 1989 Apr. – 1989 Sept.
2-14070, 1988 July – 1989 Sept.
2-16012, 1988 July – 1989 Sept.
2-16014, 1988 Sept. – 1989 Sept.
2-16041, 1988 July – 1989 Sept.
2-17036, 1988 July – 1989 Sept.
4-60378, 1988 July – 1989 Sept.
6-28863, 1988 July – 1989 Sept.
6-29359, 1988 July – 1989 Sept. Correspondence, 1977 July – 1977 Nov.
President’s Commission on Judicial Procedures, Final Report, 1983 Nov.
Stassen, Harold E., Presentation to the Ford Foundation, n.d.
Minutes, 1978 July – Dec. Academic Committee on Equal Opportunity, 1973 Feb.
1960-1986, policies and procedures, etc. University Council Ad Hoc Committee report, 1971 Dec.
Board of Overseers, 1990 Sept.